Wadena County Historical Society was awarded a grant from Five Wings Arts Council to support BookEnds. The grant will cover the costs of hosting visiting author programs in April through June. 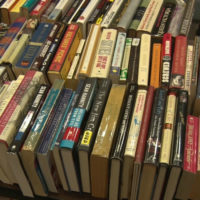 BookEnds is a monthly event that takes place on the second Saturday of each month. It is a literacy arts series that connects readers to writers. Jerry Mevissen, a local author, started BookEnd three years ago. For more information about BookEnds and other programs of the Wadena County Historical Society, visit www.WadenaCountyHistory.org.